It’s National Nutrition Month! Use this month as a time to boost a variety of wholesome foods in your kid’s diet, get them back in the kitchen for some cooking, increase family mealtime and improve your family’s nutrition! Instead of Friday Pizza Night, how about making it Homemade Sushi Night? Dedicate one night during this month to making homemade sushi with the whole family. 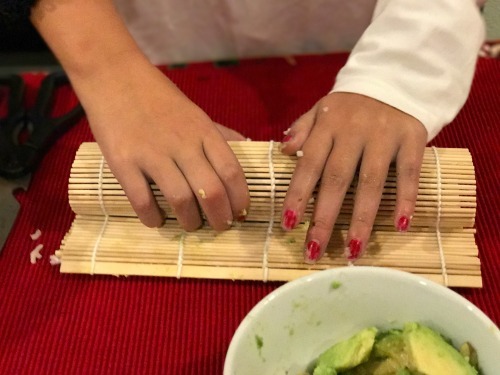 Kids love making a mess and using new toys and tools, and sushi is perfect for this! 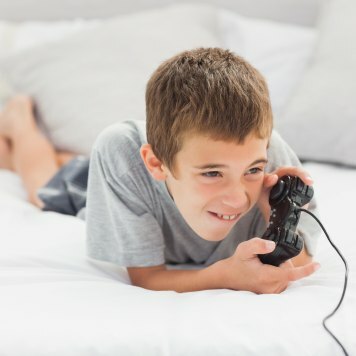 What are ways to help your kids have more fun in the kitchen? While cooking, sneak in some math skills such as the ratio of water to rice, measuring ingredients and estimations, for example, how much rice do they think they’ll need for each roll. Look up some facts about cultures that eat sushi regularly, or read a fun book like Yoko, by Rosemary Wells. By teaching your kids to make healthy choices now, they’ll be empowered to make them on their own. A research study also showed that when kids are involved with meal prep at home, they choose fruits and vegetables more often than kids who do not help in the cooking process (1). So it truly is worth the effort and mess! 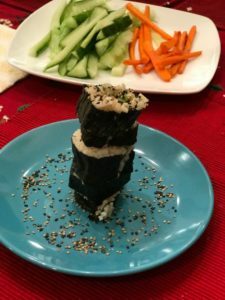 Why is sushi a great dish to make with the kids? Along with being a fun family activity, sushi is tasty, fulfilling and modifiable, so your kids can mix and match the ingredients to their liking. Say hello to a meal that is liked by every family member. 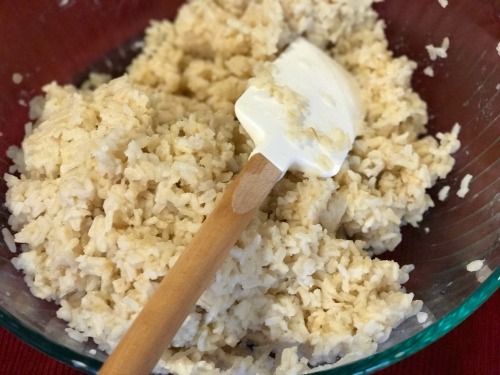 Using brown rice as a base provides a hearty source of Whole Grains, meaning it contains all three parts of the grain – the bran, endosperm, and germ. White rice is associated with a higher incidence of type 2 diabetes. So start your kids off right with a love of whole grains. Each part of a whole grain helps make it a nutritional powerhouse that provides vitamins, minerals, fiber, and complex carbohydrates. Depending on your sushi add-ins – think avocado, carrot slices, cucumber, mango, fish, shrimp, the list goes on – you will add nutritional boosts in the form of fruits, vegetables, healthy fats, and lean protein. Who knew that roll packs such a nutritional punch? Serve with a side of steamed edamame for a healthy plant protein boost! After this brief sushi making tutorial, you will be wondering why you didn’t try this sooner! Save some time! Prep the rice the day or night before Sushi Night. This will cut 40-minutes, which will help keep kids engaged in the whole process. If you know what stuffings you will be using, you can cut and slice most of these beforehand. Just save a few for the kids to wash and cut the day of. Have tools ready to go! Have all of your props and tools clean and on the counter. This will save you from scrambling and ensure you have all the necessary equipment. No sushi mat? No problem! 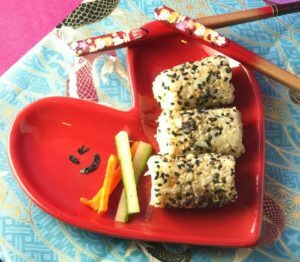 Use a firm hand or tea towel (2) or invest in a sushi mold that you can purchase online. No seaweed? A great replacement for the seaweed or “nori” are eggs. 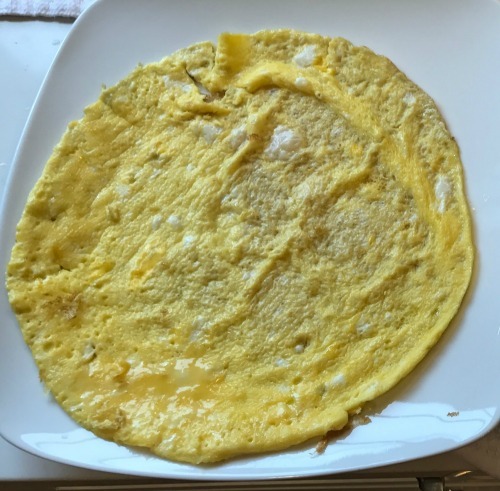 You can cook eggs in a skillet to get a round, flat shape that is a perfect sub for seaweed. See photo! Have a camera handy! Don’t just document your kids having fun in the kitchen, snap a pic of your final product! Tag @SuperKidsNutrition if you post it on Instagram, Twitter @kidsnutrition or Facebook, or send us your post and we’ll share and tag you! 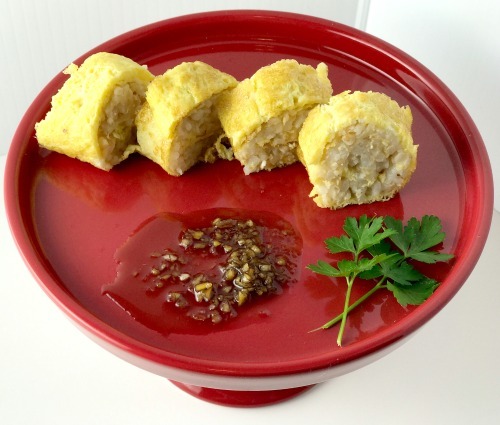 Make your sushi rice: Typical sushi rice is cooked with vinegar and sugar. 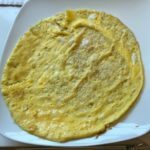 This has a different taste, and if you are unfamiliar or unsure whether your kids will enjoy it, you can stick to cooking regular brown rice. Cook brown rice over the stove or save time with a rice cooker. For short-grain brown rice, bring 1 2/3 cups of water and 1 cup of rice to a boil or follow package instructions. Cover, reduce heat and simmer for 40 minutes (3). Remove from heat and keep covered for about ten minutes to absorb all the moisture. We want it sticky! If you’ve made too much rice, don’t panic! 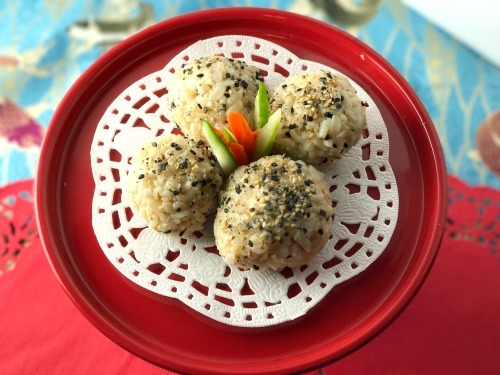 Save it to make these tasty rice balls. Prep Ingredients: With clean hands, slice your chosen ingredients. See the 2nd page of the Super Crew Cooking and Food Safety Guide before cooking with the kids The pictures show sesame seeds, cucumber, carrots, and avocado, but you can mix and match whatever you like or whatever is in season. 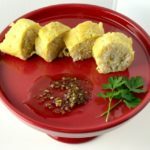 You can stick to veggie rolls (think sweet potatoes, asparagus, zucchini, mango, mushrooms, etc.) or mix in lean protein like tuna, white fish, salmon, crab meat, tofu or cooked shrimp. Wrap sushi mat: Wrap sushi mat in plastic wrap to avoid sticking. Start layering: On a flat surface, place seaweed on sushi mat – make sure the rough side is facing up. Add a small handful of rice to the center. Gently press the rice out, leaving about ½-1 inch around the borders. An inch in add your ingredients, layering one on top of the other. Roll it up: Tightly wrap the sushi mat up and around the ingredients. Continue to roll, stopping to tighten the sushi mat around the ingredients. Tip: wetting your hands with water can help prevent the rice from sticking to your hands. Slice and enjoy: Remove the sushi mat. Either wrap the roll in plastic wrap or cut without wrapping it into 1-inch pieces. 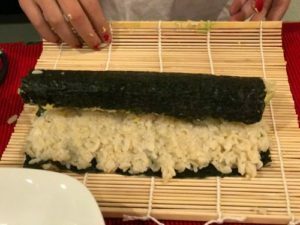 Try variations: Try an inside out roll, “maki” style, by placing the rice on the sushi mat first and then putting the seaweed on top of the rice. 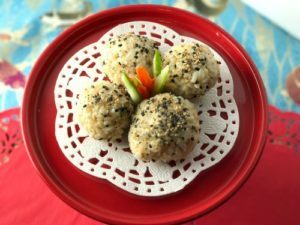 You can also make sushi “balls” by putting a ball of rice in your hand, hollowing it out, adding ingredients, then wrapping rice around them to create a ball. The great thing about Sushi Night is you can vary it each week. 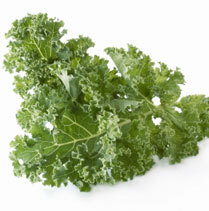 Try new ingredients or use it as a way to introduce new fruits and vegetables into your child’s diet. The combinations are endless, and you never know, you may create a combo better than any sushi chef out there! Chu YL, Farmer A, Fung C, Kuhle S, Storey KE, Veugelers PJ. Involvement in-home meal preparation is associated with food preference and self-efficacy among Canadian children. Public Health Nutr. 2013; 16(1): 108-12. doi: 10.1017/S1368980012001218. Minimalist Baker. How to make sushi without a mat. Minimalist baker website. 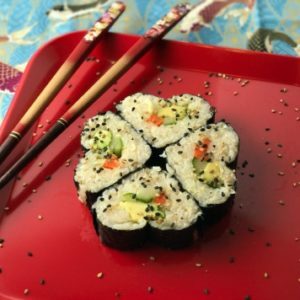 https://minimalistbaker.com/how-to-make-sushi-without-a-mat/. Published 2013. Accessed March 8, 2017. Martha Stewart. Master recipe: Brown rice. Martha Steward website. https://www.marthastewart.com/924877/master-recipe-brown-rice. Accessed March 8, 2017. Yum – for adults too!